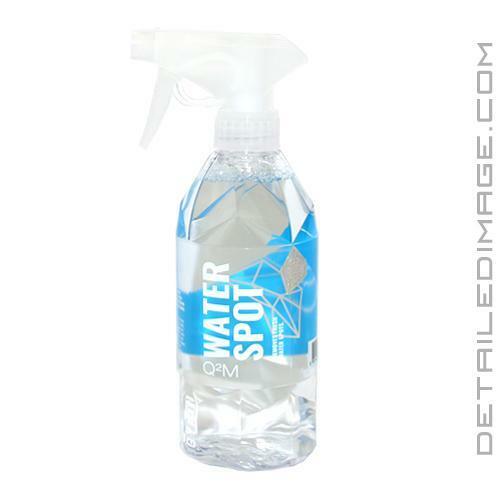 Gyeon WaterSpot helps break down and remove mineral deposits left behind by water spots! Unfortunately, water spots can actually etch in to the surface of your paint, glass, etc. and once there, they can be incredibly frustrating and time consuming to remove. The traditional option for removal is to polish the area, starting with a less aggressive polish to a stronger one, however there are now other options you should consider first. If a simple washing doesn't work apply WaterSpot onto the desired surface and wipe away with a clean microfiber towel. If you still have water spots, Gyeon does recommend reapplying a few times for best results and more vigorous wiping. The thick formula allows you to use very little product when applying. It does not diminish or dry quickly, so the area can be wiped multiple times, helping you remove water spots with less product. If you have any coatings already applied, WaterSpot can help you remove water spots in the paint without having to polish or reapply your coating. Gyeon does share a warning: "WaterSpot might affect the hydrophobic layer of a coating. It's dangerous to leave the product on the paint and especially on glass for a long time". With that advice, we always recommend applying this product in the shade and once finished washing the area with a car wash shampoo like the Gyeon Bathe or Bathe+. Don't let ugly water spots take away from the overall luster of your vehicle, use Gyeon WaterSpot to take care of them! Prevents fresh coatings from damage/degradation. Does not remove or damage the coating itself. Wash the car with a HQ, pH neutral shampoo. Rinse well and dry with a drying towel. Spray onto the panel, wait for an approx one minute and wipe carefully with a soft MF. On very fresh spots, spray onto the MF and wipe the surface. Wash the car with a bodywork shampoo afterward. Possible use on paint, plastic or any other exterior surface. Works as advertised! I highly recommend for anyone who wants to get rid of water spots on a black vehicle. Seems to work fairly well at removing water spots. It is not harsh. Will not harm a coating. It will not perform miracles. There isn't a product that can remove any heavy water spots. I owned a black car. I cringed every time it rained.